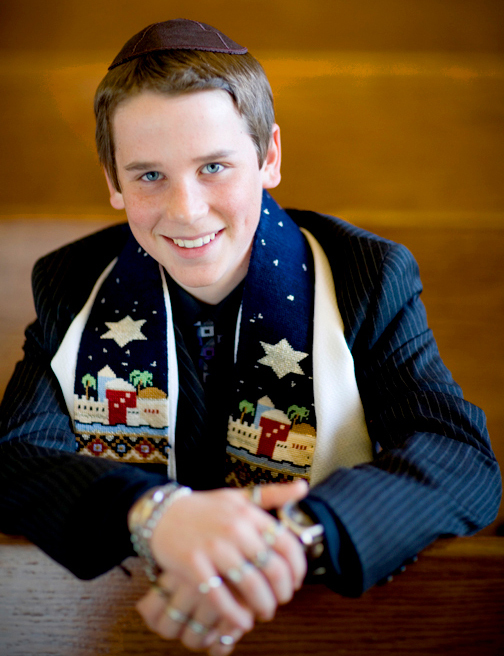 Have the Bar/Bat Mitzvah child do a pre-Mitzvah photo shoot with your photographer. Just like the engagement photo session for brides and grooms, the pre-shoot is a way for the photographer to connect with your child. The more comfortable they are with your photographer, the better the photos will come out on the big day. These photos can be used for a custom guest sign-in book, or any number of other creative uses (more on that in some future posts). If you have an early morning service, try to take the torah and family portraits on the Wednesday or Thursday before the service. This may seem like a hassle to get dressed twice, but it pays off big as far as adding quality photos to the album story. Think of it as a dress rehearsal. Wardrobe malfunctions can be dealt with along with mapping out some of the bimah blocking. Do your best to arrive at the temple at least 1 hour before the invitation time. This is easier said than done, especially with families with a lot of siblings. Think about taking 2 cars, so at least the Bar/Bat Mitzvah can arrive with one of the parents and get a few shots with the extended family. Which leads to number 4. Have the grandparents arrive 45 minutes before the service for some photos, and if there are Aunts, Uncles, and Cousins that you want photos with have them arrive around the same time. One of my favorite family photos is the grandparents with all their grandkids. Make sure your photographer knows the specific rules for photography at your temple. This is not the time to get the Rabbi or Cantor annoyed by a photographer who is not respectful to the traditions of the religious service. One temple may allow the photographer to take the torah out of the arc for some pre-service photos, and one temple may let none of that go on. A certain temple may allow photography during the service from the back of the sanctuary, one may have you shoot through a window in the AV room, or another may not allow photography at all during the service. Most importantly, make sure the personality of your photographer is one that will blend with your family, no matter haw functional or dysfunctional they are. A good Bar/Bat Mitzvah photographer is like a chameleon, and should be able to easily read and adapt to your family’s cast of characters.